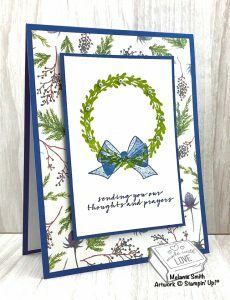 This week I am sharing with you one of my favorite stand alone stamp sets from the Stampin’ Up!® Holiday Catalog. There are only a few weeks left so don’t delay on your Holiday Catalog Purchases. The Wishing You Well Stamp set is from Stampin’ Up!® DistINKtive Stamp Technology and it comes in either wood mount or clear mount options. Here is my sample today. It is one of my favorites. The colors in the Frosted Floral Designer Series Paper are so pretty, especially with the metallic pearls. All supplies listed below. CLICK HERE to purchase yours today before it’s too late!